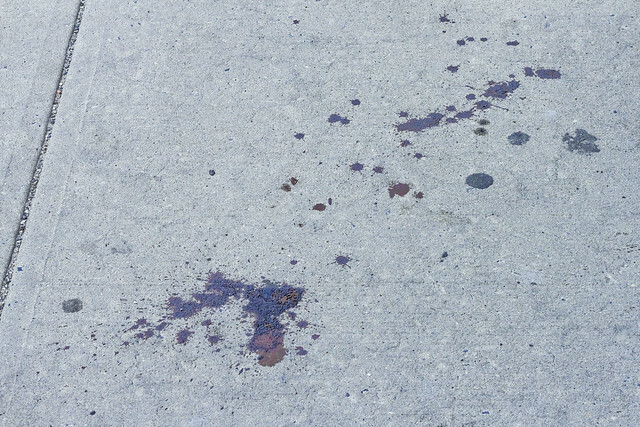 Content warning today – blood and gore, in today’s post. Not kidding. Recent endeavor carried one in a westerly direction through the Carridor – down Northern Blvd. 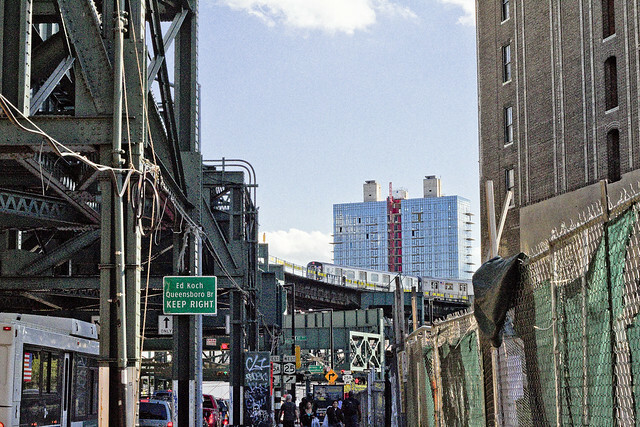 to its junction with Jackson Avenue and towards Queens Plaza, from the rolling hillocks of raven tressed Astoria. Having some spare time to kill on the way, one elected to spend some of it getting “artsy fartsy” with the camera in this overly familiar corridor. Note: Wasn’t kidding about the blood and gore stuff in this post. If you’re faint of heart, stop reading now. 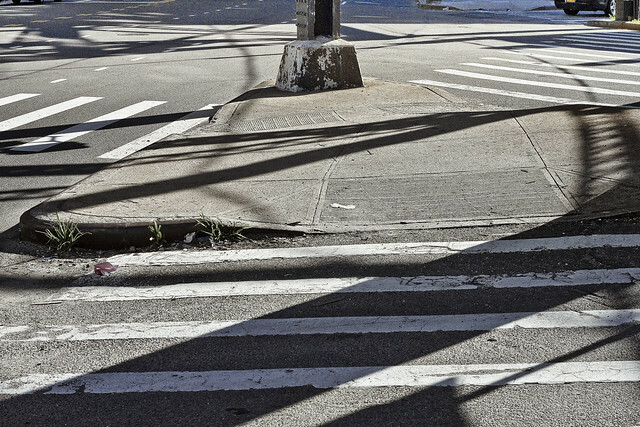 Queens Plaza and the area surrounding it are a devilish place for photography due to the contrast of elevated Subway shadows and bright sky. Hence – one such as myself likes to wave the camera around a bit in the name of staying “sharp,” exposure wise. Never know what you’re going to find around here, I always say. In the case of this particular afternoon, what I found was this unfortunate dead thing. 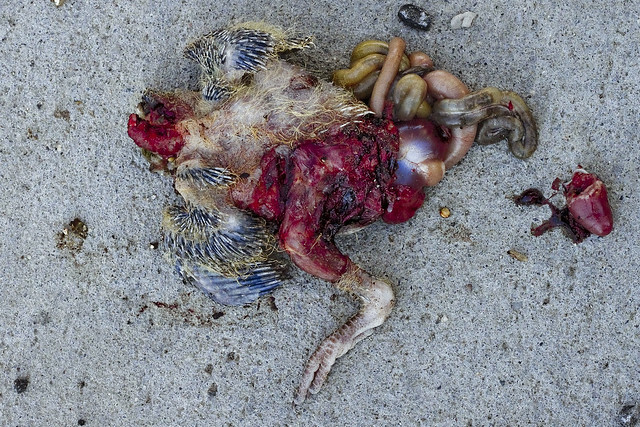 Once some sort of baby bird, something had expertly and partially skinned it and removed its head. That little bit in the lower right of the shot was actually the heart. I see a lot of dead things as I walk around – flat rats, dead pigeons and the like, but this… this was deucedly odd. Cat? Rat? Who knows? Around thirty feet further east of the dead thing, a small pile of blood was encountered. Now when I say small, it actually covered around a third of a sidewalk box, but by Queens Plaza standards this is actually a small amount. 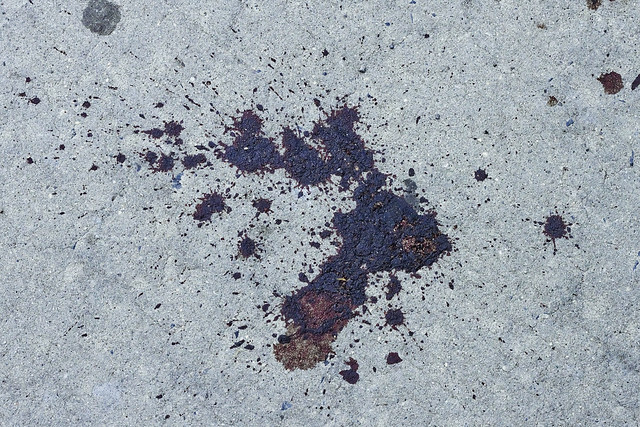 I would venture that this blood was not that of the dead thing described above, but had exsanguinated from a higher form of animal instead – likely from one of the humans who are known to infest this area. The spatter above offers evidence of the blood I warned you about at the top of the post, and the third shot contains the gore. The truth of our times, as offered in graphic narrative, is presented plainly and in full color at this – your Newtown Pentacle. might be, and btw – good show on the Steinway Mansion stuff. Thanx.. . . unfortunately those warehouse are going to get built unless Paulson comes in at the Midnight hour. A homunculus is humanoid or perhaps miniature replicant and that area is definitely not their habitat. The dead creature pictured would appear to be of the clade archosaur, likely a member of the avian variety sub-order theropoda. Our narrator should have investigated this more closely as this might be my long sought after retro-mutant velociraptor. The blood spilled from their victim and the pictured corpse one of them killed as the victim vainly fought for their life before being dragged off to be devoured in the nest. The dead thing looks kind of like this: http://dinopedia.wikia.com/wiki/Velociraptor , doesn’t it?